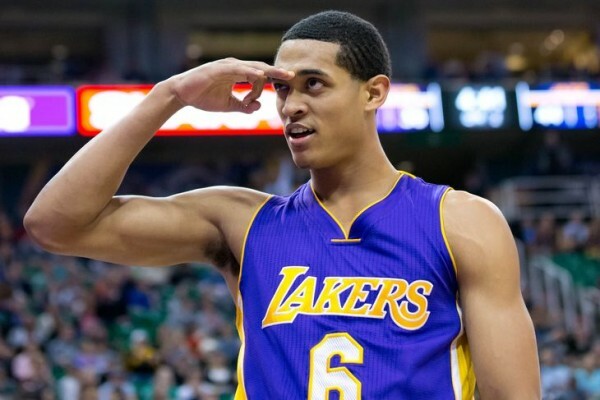 The Los Angeles Lakers win consecutive games for the first time in 2015, beating the Utah Jazz 100-97. Jeremy Lin didn’t get to be the hero again, trying a bit too hard to recapture that magical finish, while Jordan Clarkson enjoyed a very good game and Byron Scott looked as useless as ever. The only thing Scott seems to be doing is telling players to come in and come out. That’s it. The rest? Up to players’ decisions on the floor, pure luck and randomness, or some god or deity, whatever you prefer to believe in. In short – everything that happens on the court for the Lakers has nothing to do with the man who should be the most influential person for each team, the head coach. Clarkson didn’t do much in the end, but overall had a very good game, scoring 22 points and being very aggressive when attacking the rim. Lin finished with only 8 points on 3-of-12 from the field including 0-for-4 from beyond the arc. He also missed from up close, but seemed to be a bit to hung up on making shots from the outside. Maybe he was overconfident after almost everything dropped for him against the Celtics, but sometimes players have bad shooting days. This one of those games that didn’t teach us a lot about the Lakers, and more about why the Jazz, despite some of their impressive home wins and upsets this season, are failing to rise into playoff contender status. Turning the ball over 20 times against the Lakers and not taking advantage against a team that has no clue on how to play team defense is as close to a “basketball crime” you can commit this league, especially against a coach like Scott. One more point about Scott, who was so angry at his players having the nerve to celebrate a win against the Lakers while the Lakers are 26 games behind .500. Morale, happiness, camaraderie, optimism – those are all important things for athletes in team sports, even when they’re in a losing situation when you take a macro view of the situation. Even when not playing well, Lin is a big part of the mood of this team, it’s spirit. The Lakers looked a bit more like a team because of how well they performed against the Celtics. Bryant and Scott trying to bring them down, fortunately, didn’t generate a negative effect. And we’ll finish with Byron Scott, who doesn’t believe in analytics. Now, there’s a big argument in the NBA about the amount of attention you need to pay to numbers compared to actually watching the game and trying to get the feel of things regardless of what computers and stat geeks say, but ignoring advanced statistics completely as if it’s some sort of myth or fantasy trope reveals another part of Scott’s coaching philosophy, and makes you wonder why is this guy even coaching in the NBA.